Moncton Wildcats defeat the Halifax Mooseheads 6-3 in Game 7 of their QMJHL series to advance to the semi finals vs Quebec. Here are post game comments with Conor Garland, Nikolaj Ehlers, Ryan Falkenham and Danny Moynihan. Moncton Wildcats doubled Halifax Mooseheads 6-3 in the 7th and deciding game of their QMJHL playoff series. Here are game highlights from the Coliseum with a near capacity crowd of 6,215. 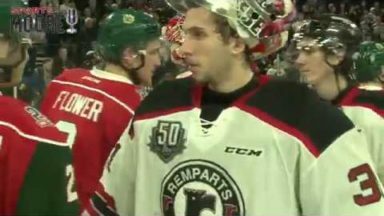 Halifax Mooseheads prepare for the 7th and deciding game of their best of 7 2015 QMJHL playoff seres with Shawinigan Cataractes. Its an overtime thriller which Nikolaj Ehlers ends late in 1st OT. Here is a look at Game Day.